This is Jade the Mesmer in her Ascalon City armor, which is called Rogue's Armor. It breaks one of the hard-and-fast rules - or what I thought until now was a hard-and-fast rule, anyway - about armor in GW, and that's that each class's armor has a default color, and sticks to it. Necros are red, elementalists are purple (or actually sort of a lavender), monks are sackcloth-tan. 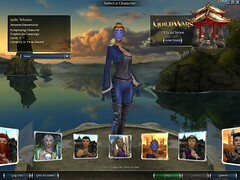 And mesmers are green, except for this outfit. I like the blue, but it bothers me a little that this outfit breaks that rule. Usually I end up dyeing my new outfits almost immediately, either because I don't like the color much (as with the monks) or because too many people have the default, as with Lily's burgundy-red necro armor. I dyed Lily's armor green, and it came out a lovely poison-green, which seems appropriate for a necromancer, and is a nice color to boot, and so far I haven't really seen anybody wearing that same outfit. Anyway, so far Jade's armor has stayed blue. I never really intended to keep Jade's armor the default (or mostly-default) green, anyway - it seemed like a little too much for somebody named Jade to have green armor. Oh, and she is masked because all mesmers are - I guess it has to do with illusion and misdirection and the things like that that mesmers do. I still don't understand mesmers very well, really, but I like playing her. Below is an e-mail I sent Col earlier today; it already needs updating. I haven't been keeping these lists for a while, but with seven characters nowadays I really need to start again. It's getting very complicated. For your entertainment, here is where all my characters are now.